This Contemporary-style Vintage Industrial Oversized World Map artwork is rustic yet cool. It makes a great conversation piece and is sure to get a "WOW!" This is a unique handmade wall hanging, made of separate lightly distressed solid pine wood boards. The design is also a one of a kind negative world map and compass art with distressed black ocean background. *Please read item description. 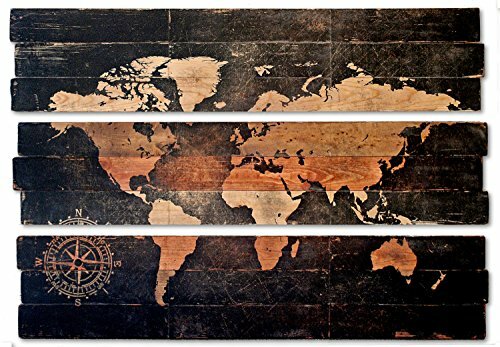 * Design - Modern World Map on distressed solid wood boards Size - Three large assembled board 50" x 11" each, 50"x33" overall. Stain colors - 6 of the 9 boards are stained Oak Brown the remaining 3 boards are American Cherry. These pieces are made to order. Due to the varying nature of real wood and the process used to create the artwork each map will vary somewhat. The above pictures only represent the general look. Complete with installed hanging hardware. Specs - Artwork is created by hand using artistic techniques on 1x4 solid pine wood boards. This piece has been lightly distressed and has small handmade irregularities making it unique and truly one of a kind. Art will come ready to hang. Made without the use of any petroleum based products. 1 1/2" thick. NO Plywood. NO Screen Printing, NO Vinyl. If you have any questions about this product by PYNEandSTEELE, contact us by completing and submitting the form below. If you are looking for a specif part number, please include it with your message.